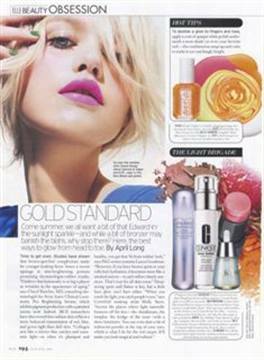 Bright polish and skin brightening lotions and bronzers are popping up for summer, according to Elle. For the brightest possible nails, "Apply a coat of opaque white polish underneath a neon shade (or even your favorite red) — the combination amps up nail color to make it eye-catchingly bright," the magazine recommends. Featured colors are Essie Bright Tights (orange), Essie Pink Parka (fuchsia), Sally Hansen Complete Salon Manicure in Grass Slipper (green), and OPI Nail Lacquer in Alpine Snow (white). On the model is OPI Jade Is The New Black polish.